This year we have a new teenager - 13 and a 10 year old. Both double digits... how did time fly by so fast. I mean, really! I think the double digits were harder for me to deal with than any other year. But I LOVE this stage in our life. The oldest talks to us more and will actually have a conversation and joke around with us verses a few years ago when she would stay quiet and stay to herself. WE love that she has bloomed into an amazing teen. The youngest still talks all the time. She sings. She hums ALL the time. She just is a happy kid. Always has been. Here is the 10 year old at her birthday party. She got a big one this year and it was at Dave and Buster's. 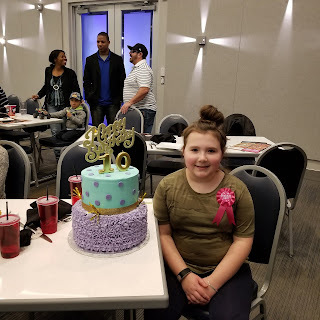 It was a lot of fun and we really enjoyed her party! And this is the teenager. 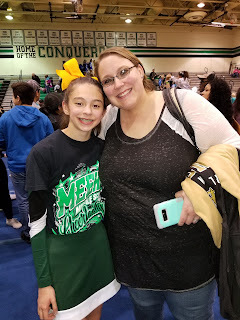 This was during one of her competitions for cheer this past season. Their cheer team got 1st place in all 3 areas during state competitions. What an amazing thing to watch. Cheer has completely changed this girl and we LOVE IT! I look forward to the next 8 months of 2018. May they bring awesome family bonding time, new adventures and many dreams come true!